Mauritius is the chosen venue for sweethearts from all over the world to hold their wedding ceremony. Almost all nationalities of the world can have a legal wedding here in the beautiful paradise island of Mauritius. Though it is not possible to avoid the legal paperwork, we do our level best making sure you will finalize all the paperwork quickly and stress free. 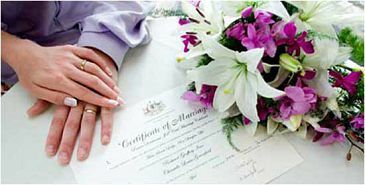 The most important regarding the wedding paperwork is to make sure to bring with you all the originals of all the required documentation. Which documents do we need to provide? At least eight weeks before your departure to Mauritius, our wedding coordinator should receive copies of all necessary documents (can be sent by email / post / fax). The couple should also plan to have a free day in Mauritius before their wedding day (must be a working day – not public holidays/Saturday/Sunday) so they could finalize all the local legal procedure for having the required papers for their wedding in Mauritius. In order to finalize the wedding paperwork, the future couple will have to go to four different offices that are situated in Port Louis. All along, the couple will be accompanied by our company’s driver and a wedding coordinator. Supreme High Court of Mauritius – the couple will Swear Affidavits at the supreme high court of Mauritius. It is very important that the couple will be well dressed - no shorts for men and arms covered for women (no need for shirt/tie/jackets - smart/casual is acceptable). No children are allowed in the Supreme High Court of Mauritius. Civil Status Sub Office – the last office to visit is the Civil Status Sub Office which is found in the district closest to your hotel for the publication of the wedding. At this point you will discuss the wedding time and vows with the civil status officer. The Civil Status Officer is the only person who can confirm the wedding time.